For the Media: The redesigned SANIPLUS is 10 decibels quieter than the previous generation. EDISON, NEW JERSEY (MARCH 1, 2010) — The redesigned SANIPLUS – part of the new “Quiet Range” lineup of macerating systems from SFA Saniflo – offers faster cutting action and a quieter performance that is nearly 10 decibels less than the previous generation. 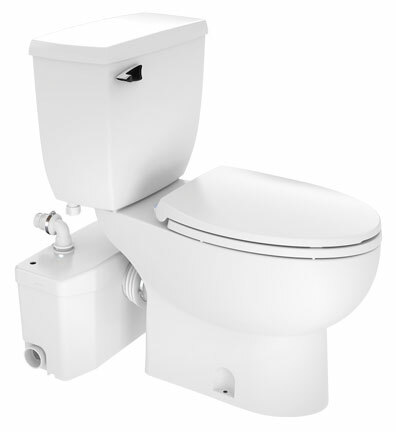 The noise levels of older SANIPLUS units are comparable to that of a conventional gravity-flush toilet, notes Saniflo CEO Regis Saragosti. Nonetheless, the recent introduction of the new, quieter SANIPLUS is in response to user requests to lower the volume a bit. 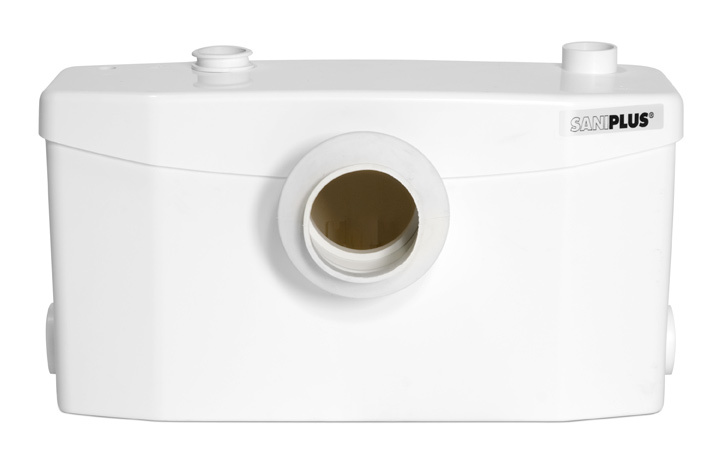 Available with a round or an ADA-compliant elongated bowl in white or with an elongated bowl in biscuit, the SANIPLUS has been the most popular of the Saniflo macerators since they were introduced in the United States in the late 1990s. Although the redesigned version has a more streamlined, contemporary look to complement any modern décor, the dimensions for the three inlets and the discharge and venting outlets on the unit remain exactly the same. As a result, current owners of SANIPLUS systems need not redo the piping to install the newer model. “That makes replacement more convenient, while saving time and money,” says Saragosti. A 20% smaller, more powerful pump motor performs the macerating function more quickly, thus emitting less noise and vibration. Thanks to these and other improvements, the new Saniplus has a sound level (emitted and transmitted noise) of only 34.9 dB(A), as compared with 43.9 for the previous model. Note: According to the Trace R&D Center at the University of Wisconsin-Madison, a home dishwasher has a sound pressure level of approximately 50 dB(A); normal human conversation, 60; a vacuum cleaner at 10 feet, 70; and a garbage disposal, 80. (For more information, see: http://trace.wisc.edu/docs/2004-About-dB/. 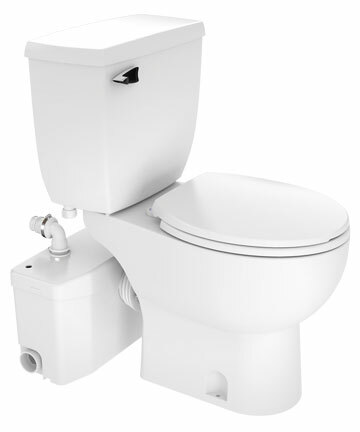 Like its predecessor, the new and quieter SANIPLUS uses above-floor plumbing technology to handle waste not only from a rear-discharge-type toilet, but also from a sink and a tub/shower. This permits the creation of a complete bathroom atop any finished floor where there is no under-floor drainage. Walls and floors remain intact, and installation is accomplished quickly and economically with minimal disturbance to room layout. A complete bathroom can be operational in as little time as a half-day. Certified to American and Canadian standards, the new SANIPLUS is CSA-certified and IAPMO (UPC)-listed and complies with its applicable standard: ASME A112.3.4 (U.S.A.) and CSA B45.9 (Canada). Saniflo warranties the SANIPLUS, including all electrical components, for 24 months. For more information about SANIFLO, call toll-free at 1-800-571-8191 or visit the Saniflo website at www.saniflo.com. The Saniplus macerator hidden behind the wall, serving an elongated Saniflo toilet bowl. The Saniplus macerator shown in front of the wall, serving an elongated Saniflo toilet bowl.